Yes, I know Mike Shanahan is a good coach – though he hasn’t won anything of significance since John Elway retired (look it up). And I am sure dude wants to win in Washington more than anything. But after seeing Shanahan draft Kirk Cousins in the fourth round after he mortgaged the future to draft Robert Griffin III, I have reached the following conclusion: dude REALLY wants to get fired. I mean, the Redskins did not exactlyset the world on fire last year. They were 5-11! They had needs other than drafting two rookie QBs. What in the hell was Shanahan thinking? Let me put it this way: when you already have Michael Jackson, you do not bring in Prince and ask him to be Jermaine Jackson because Prince will eventually think he is better than Michael. That is what is going to eventually happen in Washington. From what I have been hearing, people say that Cousins is a born leader. Cousins works hard to be good, and it showed when I watched him at Michigan State. Even though he lasted until the 4th round, Cousins is good enough to start in this league. 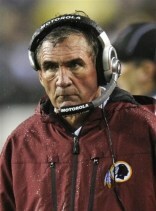 Now you bring this young man in after RG3 has all but assured that he will be the man going forward. This is a QB controversy from hell (or heaven if you are a Cowboys fan) waiting to happen. Shanahan downplayed the issue by saying that RG3 is his guy. I tell you what, for Shanahan’s sake I hope he is telling the truth. Because if he let’s this QB controversy wreck his team when it didn’t have to happen, Shanahan will not be around to see if Cousins is really better than RG3. Jimmy Johnson drafted Steve Walsh same year Aikman was drafted and we know how that turned out….give the dude a break! Smart move by Shanahan. Never know when you will need a quality QB to backup because of injury and weak play. Checkout nflfemale.com The #1 NFL site 4 women. Have to go with Klownchild on this one. While I agree that having a good backup QB is vital, it seems that you would want a veteran to play the dual role of mentoring RGIII and being ready to step in if he gets hurt or needs a break. Something like what Kitna did for Romo. Having to train two rookie QB’s would be taxing on a coaching staff, I would imagine.